Charming Ranch style home in Amberly Woods Subdivision on a quaint culdesac location. Home has been freshly painted throughout and New Carpet installed in Great Room and all Bedrooms! 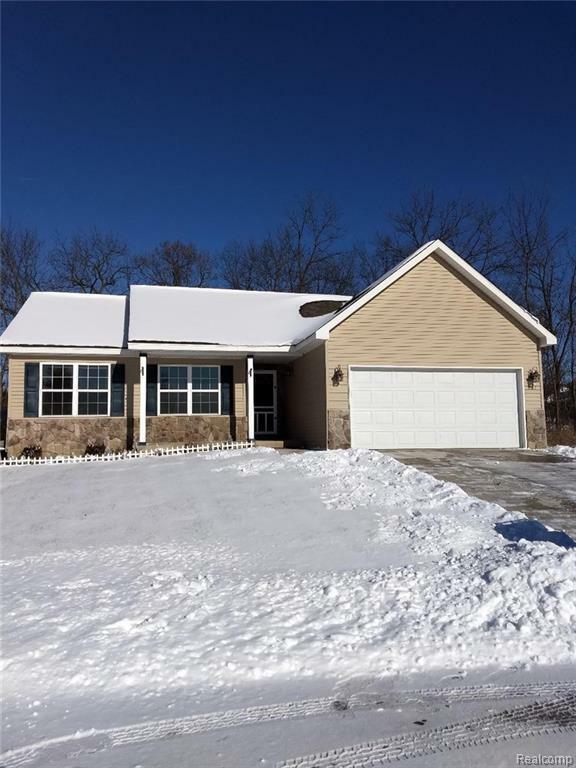 Home features 3 Bedrooms and 2.5 baths, Private Master bath with walk in closet, beautiful Great Room features Cathedral ceiling and a Gorgeous Wood burning fireplace, just in time for those cool evenings to snuggle up to. Kitchen also features a cathedral ceiling which makes for a wonderful open floor plan. Partially finished Daylight basement which has 1/2 bath and awaits your personal touches for completion which would give you an additional (approximate) 1000 square feet of living space. Nice deck off dining area for gilling out or just sitting and relaxing. First floor laundry for your convenience which has ample storage, 2 car attached garage. Purchaser to assume assessment. LICENSED REALTOR MUST ACCOMPANY BUYERS AT ALL TIMES. NO VIRTUAL SHOWINGS. IDX provided courtesy of Realcomp II Ltd., via Prestige Real Estate Llc and Realcomp, ©2019 Realcomp II Ltd. Shareholders.